Single-serve desserts are perfect for entertaining. 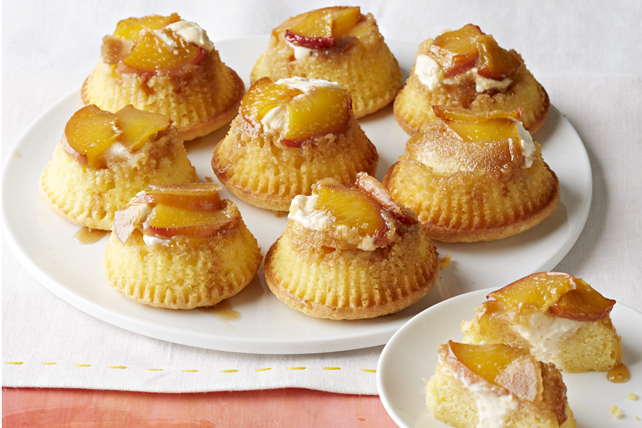 This recipe for Peaches & Cream Mini Upside-Down Cakes yields 24 delectable desserts - enough to feed a crowd. Line 24 muffin pan cups with foil liners. Combine sugar and 1/4 cup butter; spoon into prepared muffin cups. Top with peaches. Bake 18 to 20 min. or until toothpick inserted in centres comes out clean. Cool 10 min. Transfer cupcakes to wire racks; cool completely. Beat remaining pudding mix and milk in medium bowl with whisk 2 min. Stir in Cool Whip. Spoon into pastry bag fitted with large plain tip. Insert tip into centres of cupcakes, then pipe pudding mixture into cupcakes. Refrigerate until ready to serve.